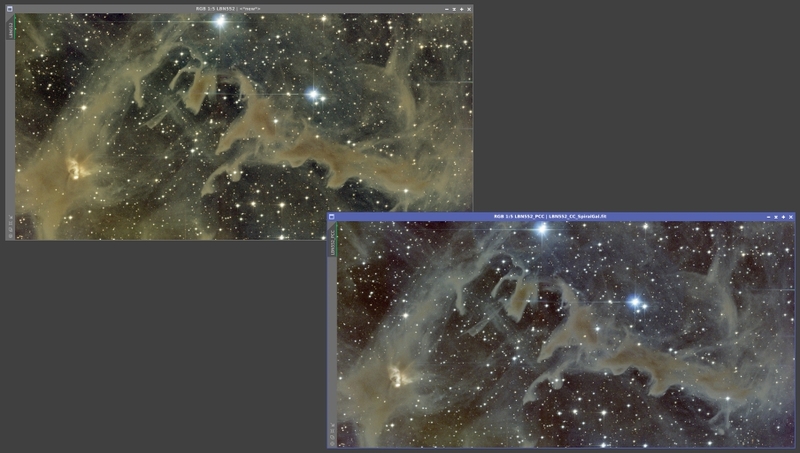 Further news on the next version of PixInsight. Today we have been working on an exciting new tool: PhotometricColorCalibration (PCC). We have a first working version with really outstanding results that I want to share with you all. Here are a few examples that Vicent and I have been preparing to show you the kind of results you may expect from PCC. The original combined RGB image, shown on the top-left, had already been white balanced using the average color of the stars in the frame as white reference. The newly calibrated image with PCC is on the bottom-right of the screenshot. The difference speaks by itself. After applying PCC, the image shown on the right has been stretched nonlinearly with HistogramTransformation, processed with HDRMultiscaleTransform, and its color saturation has been increased with CurvesTransformation. Besides its underlying high-accuracy astrometric and photometric analysis implementations, the most innovative and powerful feature of our new PCC tool is, in my opinion, the fact that it allows you to select one among numerous predefined, carefully generated white references. By default, PCC applies a white reference based on the average of the characteristic fluxes of Sb, Sc and Sd galaxies. This reference, which has been used in all of the examples shown above, is in our opinion truly representative of the deep space, and hence an unbiased, neutral white reference quite close to our documentary color philosophy. If you want to persist in making common conceptual mistakes, you will be able to use the G2V spectral type as a white reference—but PCC will allow you to select virtually any spectral type, along with several galaxy types, to calibrate the color of your images automatically and accurately in PixInsight. A huge kudos to Andrés del Pozo and Vicent Peris, who are the authors of the excellent implementations and algorithms behind the new PhotometricColorCalibration tool. Thank you for your continued support and contributions, which make PixInsight an exciting platform in constant evolution. 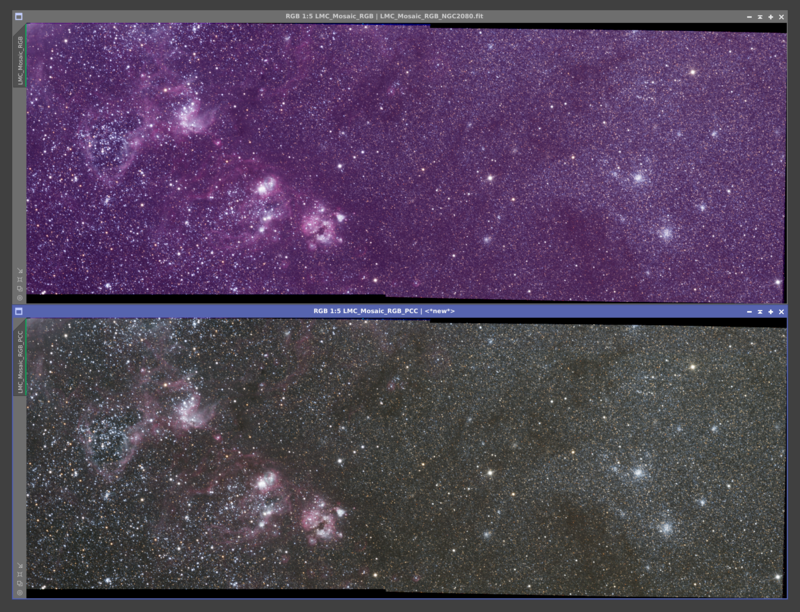 Yet again PixInsight raises the bar in the field of astroimage processing, with yet another totally scientific and statistical apporach to the solution of a problem that has, so often, previously been attacked 'artistically' or 'subjectively'. This is amazing! I was just working on something along these lines, using the AperturePhotometry script! where the elements of the 3x3 matrix M, and 3x1 vector [RGB]_bias, are obtained by fitting the detected data to the catalog photometric data. Is this something that could be accomplished by the new module, or white balance will be handled in the standard three (RGB) multiplicative factor? "Photometric data are retrieved online from the APASS survey - do you also think of including the SDSS-DR9 catalog? Thank you so much to all. Don't worry, Harry, the PCC tool will have lots of parameters to control the astrometric solution and the photometric analysis, along with the background reference, so you'll have plenty of numbers to play However, the tool will work fine with default parameters in most cases, if the image has the required metadata. Hi Rick. You'll *never* have to do this again in PixInsight. The new large-scale pixel rejection feature of ImageIntegration works flawlessly. It works so well and is so robust, that you'll be able to integrate a data set simply ignoring all plane and satellite trails, etc. Just as if they didn't exist in virtually all cases. The current (first) version of the PCC tool computes scaling factors for the individual RGB components. The mean background is sampled and evaluated through robust statistics from a user-defined region of interest, just as the current BackgroundNeutralization tool does now. However, your idea looks very interesting, and I think it could be implemented without problems. I also think your approach is sound and should work well. The PCC tool will be released as an open-source product (under PCL license), so it will be available at our open-source GitHub repositories, and hence open to collaborations. Our PCL development framework has all of the necessary resources to implement what you want (and in case it lacks something, we can implement it). This would be an excellent improvement. do you also think of including the SDSS-DR9 catalog? The new PCC tool uses the latest release of the APASS survey as its source of photometric data by default. However, PCC is very flexible, so you can use basically what you want. You can select any catalog currently supported by the AperturePhotometry script (which, by the way, should be renamed to Photometry IMO, since it now performs both aperture and PSF photometry). As I have said before, PCC will be released as an open-source module, so it will be open to collaborations from external developers. With the new version 1.8.5 of PixInsight, we'll release almost all of the new tools as open source products, including LocalNormalization (previously announced as FrameAdaptation), SubbandBlending, and of course the new features that will be available in ImageIntegration and DrizzleIntegration, among many others. I am betting very hard on open source releases, as the best way to reinforce the required dynamism on the PixInsight platform. What is SubbandBlending going to be ? please let it be image blender !!!!!!!!!!! so what's the timeframe like for release of 1.8.5? i have a boatload of my usual crappy LP data that i have been holding off processing because i'd like to try the new normalization stuff. The final name is still subject to discussion It will be a new tool to generate seamless mosaics using, among others, the sub-band blending (SBB) algorithm. SBB was first described, AFAIK, by P.J. Burt and E.H. Adelson in A Multiresolution Spline With Application to Image Mosaics. My implementation introduces significant changes and uses powerful multiscale techniques that we already have implemented in PixInsight, instead of Gaussian pyramids, but follows the same basic idea. SBB is also used with great success in well-known panorama generation applications, such as AutoStitch for example. so what's the timeframe like for release of 1.8.5? I still don't dare to anticipate a release date. It should happen during the first half of June. Version 1.8.5 is a very complex release, with very significant changes to the platform (as usual, much more and much deeper changes than what the user will see on the surface), many new tools, and many and very important improvements and new features. The new version 5.8.0 of Qt is fantastic, but as usual, it generates new problems and incompatibilities with our code base, which I have to fix. I already have a 1.8.5 version working extremely well on Linux, which I am using to concentrate all of my work on the new tools and improvements for now. So the macOS and Windows versions still require a lot of work. So I ask for (even more!) 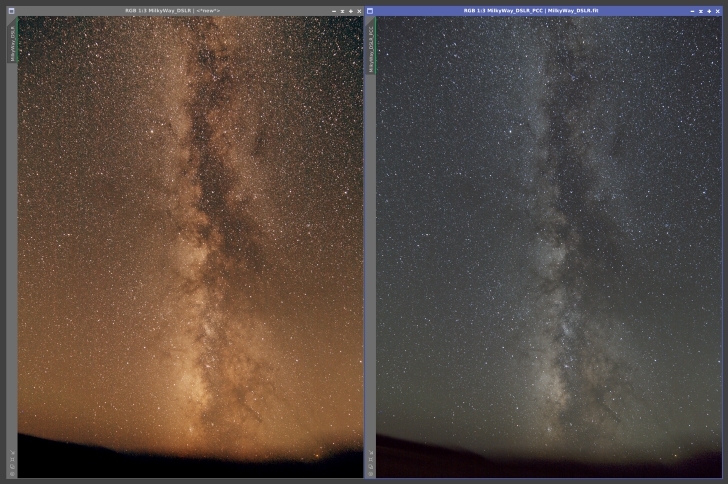 patience; 1.8.5 will be the best, most powerful and most stable version of PixInsight ever. AperturePhotometry can already use SDSS-R8. Supporting the release 9 should be very easy.